If your dog has had an injury, surgery or illness it can be a major disruption in your life. The condition itself or treatment of the condition may cause other side effects, such as pain, neurological deficits, fatigue, urinary incontinence or physical disabilities. Most of these are temporary while your dog recovers, but sometimes the side effects can be permanent. 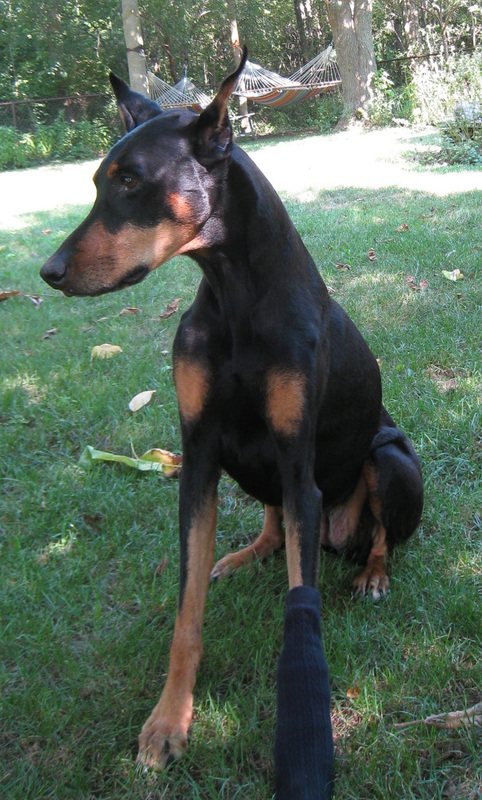 Our dog Lena recently had surgery and follow-up treatment for a soft tissue sarcoma on her leg. * The treatment has required daily bandage changes and drugs that have exacerbated a pre-existing condition, urinary incontinence. This type of incontinence occurs when she is asleep and had been well controlled with the drug Phenylpronanolime (PPA). The site of the surgery and treatment is still sore and since Lena already had neurological issues she has some difficulty getting around. Ambulation and incontinence are both common problems for convalescing dogs and there are some simple and inexpensive ways to deal with both. (More information can be found in this Resources for special needs, our book or this previous post). 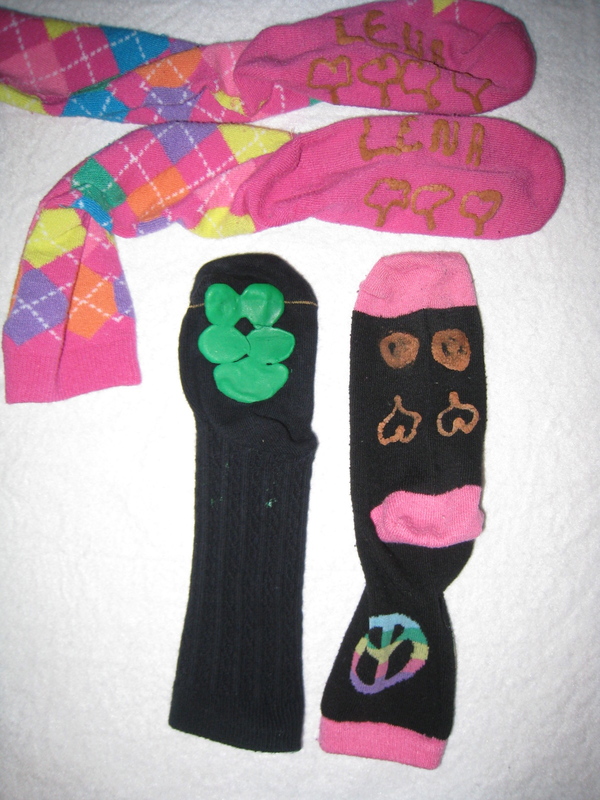 A vet technician where Lena was treated showed me how to make socks with non-slip fabric paint. Over the years I have bought and tried numerous boots to prevent Lena from slipping. Some of them fell off, some did nothing to prevent slipping, some are too stiff and others were just too hard for her to adjust to. The best non-slip boots were Pawz Dog Boots. While these work very well they don’t breathe, and might be too tight around the leg, so don’t leave them on for long periods of time. I wish a human shoe manufacturer would design something more appropriate for dogs. The socks I made were 100% cotton girl’s knee socks. I bought the smallest size available. I chose knee socks because I needed the sock to cover the bandage on her leg. I washed the socks in hot water and dried them on medium heat to be sure they would shrink. I painted a dog paw pattern on the bottom of each sock. The paint was purchased at a fabric supply store and the brand was Tulip. I chose the “puffy” and “soft” style paint because this is a bit more “gripping” on slippery surfaces. Incontinence requires more preparation. During the day I use multiple dog beds with a bed pad placed underneath it. The beds are old quilts that I have cut up into smaller pieces. This makes them easier to wash. Under the bed pad I placed a thin, lightweight foam dog bed. For dogs that have ambulatory issues the bed should not be too thick or too soft because that makes it difficult for them to get in and out of the bed. At night I use a thick fleece product known as medical fleece, or vet fleece. Some brands include ProFleece and Palace Pet Beds. Under the fleece I place layers of 2 to 3 reusable bed pads. If I need to, I can remove the top bed pad during the night to help keep Lena dry. The fleece allows urine to flow through to the bed pad to help keep the dog dry. It’s not a perfect system, but it does help. There are dog beds that can also be used for this purpose that work very well. (Resources for special needs). I have used the Dry as a Bone Incontinent Bed in the past, but because the bed is raised Lena can’t sleep in a bed like that now. Vet fleece with bed pads work well if the dog sleeps on your bed. Vet fleece, smaller quilts and bed pads can all easily be washed and dried. To keep Lena clean I use grooming wipes and dry shampoo. I use the brand Earthbath for both. It’s very important to keep incontinent dogs clean to prevent sores, especially between their legs. *Lena’s recent health issue has required my full attention and is the primary reason there have been no posts since late May. She continues to recover and is doing exceptionally well. This entry was posted in dogs, Interior Design, Products, Special Needs and tagged cancer treatment, non-slip dog boots, physical disabilities, Surgery, Urinary incontinence. Bookmark the permalink.